As with all racing safety equipment, racing suit fitment is critically important, and the racing suit user can increase the risk of injury if they are not fitted properly. Please refer to the general racing suit sizing chart below for proper racing suit fitment. This chart is for ADULT racing suit sizing only. YOUTH, JUNIOR and CHILDREN sizes are not included on this sizing chart. If you need a suit size outside of this chart range, please contact our Technical Sales staff for size availability within the G-Force® Racing Gear product offerings. A - Chest - Measure the circumference around the fullest part, under the armpits, keeping the tape horizontal. 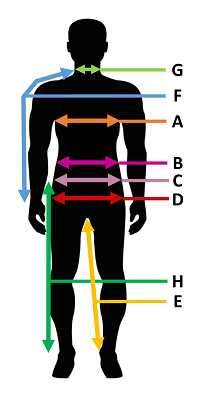 B - Stomach - Measure at the largest circumference, keeping the tape horizontal. C - Waist- Measure the circumference at the normal belt line & natural waist line, in-line with the navel, keeping the tape horizontal. D - Hip - Measure the circumference around the fullest part of the hips, about 6-7 inches below the waist line, keeping the tape horizontal. E - Inseam - Stand against a wall, ask someone to measure from the crotch area to the bottom of the leg. F - Sleeve - Measure from the back of the neck at the center to the wrist with arm bent 90-degree angle at the elbow. G - Neck - Measure the circumference around the fullest part of the neck line, keeping the tape semi-taunt. H - Waist-To-Ankle - Stand straight up, ask someone else to measure from the waist to the ankle-bone, keeping the tape vertical. Once measurements are completed, please refer to the sizing chart below to find the G-Force® Racing Gear racing suit size that best fits your measurements. If you DO NOT find a suit size that works well, you may have to consider having a custom racing suit made by the factory. If this is the case, please refer to the CUSTOM RACING SUIT section listed below. Racing Suit Sizing Chart Note: Youth and Junior sizes for G-Force® Racing Gear Racing Suits are also available. Please contact our Technical Sales staff for availability and pricing. G-Force® Racing Gear Custom Racing Suits ensure that you are perfectly fitted while tearing up the track. If you require a custom-tailored racing suit made to your specifications, get a head-start now by downloading the G-Force® Custom Racing Suit Order Form by clicking the button at the right. After you have taken your measurements, please contact our Technical Sales staff for a price quote and estimated delivery date. 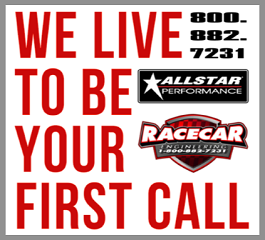 Please remember that Racecar Engineering™ carries a full assortment of G-Force® Racing Gear racing suits. 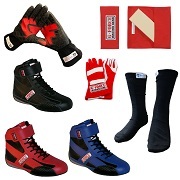 On top of that, we also have in stock and ready to ship, driving gloves and shoes, underwear, hoods, socks, helmets, helmet supports, harness pads, restraints, helmet skirts, gear storage bags and much more. *** RACING SUIT SIZING/FITMENT CHART DISCLAIMER: This racing suit sizing/fitment chart has been created by Racecar Engineering™ for our customer&apos;s reference and ease-of-use using the latest fitment information available from the factory. Please always refer to the factory website, factory printed materials and factory personnel advice for the latest racing suit information about their brand of safety product. The G-Force® Racing Gear factory website can be accessed directly at www.gforce.com. (link opens new page) - Racecar Engineering™ is not responsible for any typographical errors contained in this racing suit sizing chart/fitment material or the end-user&apos;s failure to verify & follow factory fitment specifications.